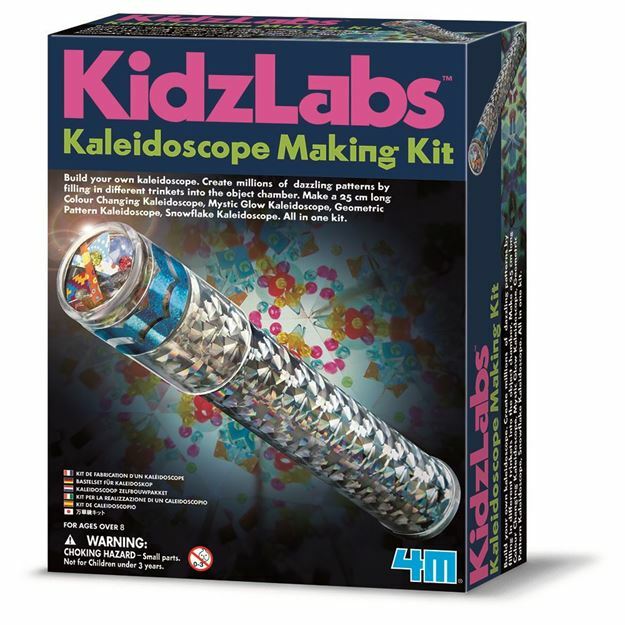 Make a kaleidoscope that includes a specially designed object chamber with a movable cover with 4M. Simply change the different trinkets included in the kit to make a colour kaleidoscope, mystic glow kaleidoscope, sparkling holographic kaleidoscope or snowflake kaleidoscope. You can also put in your favourite trinkets to create your very own style kaleidoscope. Includes: a paper cone, holographic foil, chamber with removable cover, 3 safety mirrors, 4 bags of different trinkets (glow, holographic, colour and clear transparent), 3 colour filters, an eye piece cover, card stripe, double adhesive stickers and detailed instructions. Age 8+ years. Part of the KidzLabs range. Distributed in New Zealand by Holdson.